NHL Slapshot is a Wii game in the Sports genre. The game was published by EA Sports and developed by EA Canada. The game has an ESRB Rating of E (Everyone 6+) and was released on 2010-09-07. The game's official site can be found at nhlslapshot.easports.com. After playing NHL 11 for the xbox 360 I was looking for a fun Wii game to play with my friends when they come over on the weekends...this arcade hockey game suited that purpose perfectly. 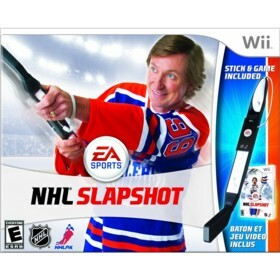 This game is a wii exclusive that stars Wayne Gretzky so it should be a hit :). It features the same basic gameplay as the NHL series by EA sports so if you are familiar with those games you will instantly enjoy this game. It features quick action and innovative controls that suits quick play sessions for casual hockey fans. The graphics and sound are very good but the main benefit of the wii is it's motion controls. The great news here is that EA has included a nifty "hockey stick" controller add on with every copy of the game, so you can feel as though you are really playing hockey using the included stick :). It really is pretty awesome and quite fun. The main negatives of this game is that it has no online mode and the fact that it is not as realistic as the other NHL games out there. However, if you are looking for a fun arcade NHL game that lets you feel as though you are really playing hockey then this is the game for you!